Published in the UK as The Jewelled Kitchen: A Stunning Collection of Lebanese, Moroccan and Persian Recipes. I don't know if there's an error in the recipe or if it was me, but the batter for these pancakes was an absolute disaster - one of the few things I've attempted that I actually couldn't even finish making. After sitting, the batter was way thicker than heavy cream - hardly a batter at all, in fact. I thinned it with a bit of water and the pancakes were just strange and rubbery. Now to put my new cannister of argan oil to use in another recipe! The Middle East cradles an ancient cuisine—one of the oldest in the world. Despite its pedigree, conflict in the region has largely kept it under wraps to a wider audience. Hummus, tabbouleh, and stuffed vine leaves now receive global recognition, but there still exists this vast and distinct culinary heritage that remains unexplored: wholesome stews, exotic casseroles and a range of home cooking which revolves around humble, yet delicious vegetables and grains. It is these that routinely welcome home hungry school children and soothe the appetites of tired workers. They too must be shared with the world. For the past five years, Lebanese-American Bethany Kehdy has sought to demystify Middle Eastern food through her blog DirtyKitchenSecrets.com and her Taste of Lebanon tours. 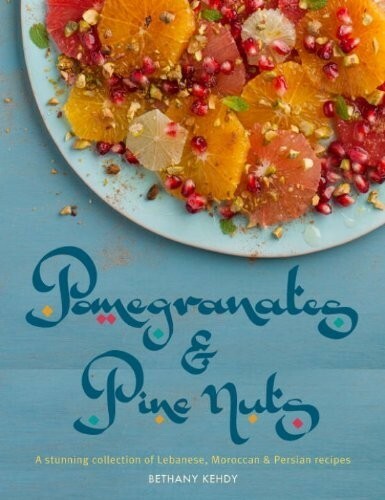 In her debut book, Pomegranates & Pine Nuts, she provides 100+ new recipes that will introduce you to the wonders of the Middle East and change any thought you might have had that this hearty cuisine is complicated or laborious.